Conversion marketing is serious business over here. In fact, we care about it so much that we created a whole glossary to help explain it to the world. But clearly, not everyone is on the same page as us. And we’re okay with that – especially when the results make us LOL. 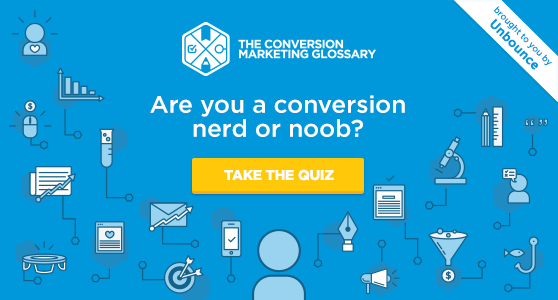 So take a break from your super serious life to peek deep into the armpit of the internet (aka Urban Dictionary) and compare actual conversion marketing definitions to more… creative ones. Since context is everything, let’s start there. Good marketing experiences don’t leave prospects hanging. Smart marketers keep the conversion going from click to click, acknowledging where prospects came from. On a high converting landing page, typically context is used to design an experience that speaks to the desires and motivations that someone had prior to clicking on your ad. But what do the pros over at Urban Dictionary have to say about context? That’s a good start, right? Sounds like a reasonable explanation. Credibility is an age-old (but still important) marketing concept. In a nutshell, it tells people whether the operation you’re running is to be trusted. You say you’re awesome, but is that enough? You want to come across as somebody savvy that knows what they’re doing. And you need to back it up with proof. Proof could come in the form of endorsements, testimonials, badges, yada yada. You’re probably sick of reading about credibility. But what do the goons over at UD have to say about it? Sounds like Bob could use some social proof to help his case. Don’t be a Bob. Back up your claims with solid social proof. Friction is the psychological resistance that visitors experience when trying to complete an action. It can be caused by unclear messaging, lack of information or unintuitive layout (and so many other things). Where there is friction there is opportunity. Either you solve it for your customers today or a competitor will do it tomorrow. But what does friction mean for the users of Urban Dictionary? Let’s pull this definition straight from the Conversion Glossary. The hero shot is generally a photo or a video and should clearly show benefits and context of use. Actually, they basically nailed it. Choose the ideal image of your product or service in action and put it front and center on your landing page. There’s your hero shot. You really should know what a landing page is by now. Nothing new here. Whoa, that’s not very nice! Clearly someone had a brutal landing page experience he’ll never forget. I kind of feel his pain. A lead is someone who has shown interest in your business by providing their email or other contact information. Why does this matter to marketers? Let’s see what Kipp Bodnar has to say about that. Leads are the metric that, as marketers, we have to rely on. Because leads mean money. Err… I think that’s exactly the opposite of what we want. Urgency is another one of those age-old sales/marketing tricks; the use of trigger words such as “act now” or “limited supply” to increase your prospects sense of having to act now. Urgency is when a buyer feels like they need to act quickly… [it’s] the feeling that whatever is going on is really important, and therefore, immediate action should be taken. Phrases such as “Hurry!” and “Only 1 spot available” trigger urgency and motivate prospects to spring into action. Image source. Surprisingly, it seems as though some of these trolls have a bit of marketing knowledge after all. Tia is a digital strategist with experience ranging from social media management and community building to customer success and product marketing. She got her start in the non-profit sector before she was drawn to startup life (contributing to the growth of Unbounce and Buffer in the past), and is most passionate about helping others achieve their goals. Her pride and joy is her adorable white husky, Gronk.